Photo booths are the current “must have” wedding entertainment. 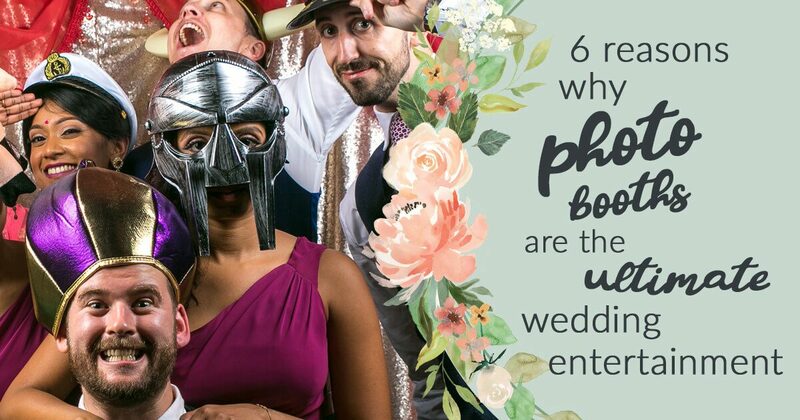 Here are six reasons why your wedding NEEDS a photo booth. Let’s be honest here, you want your wedding to be the best day of your life. Just as importantly, you want your wedding to be talked about. You want it to be remembered by every single one of your guests as being the best wedding they’ve ever been to. So what will set your wedding apart from all the other weddings you’ve been to? How about a photo booth? Hear us out and you’ll soon realise just how much your wedding needs one. A photo booth is for everyone. Mums, dads, friends, grandparents, even your pets (although most people probably wouldn’t recommend you bring your pet to your wedding). People of all ages can join in and dress up with silly hats, masks and props and look like complete fools. The official wedding photos will be the ones that you put on your mantelpiece. Photo booth creations will be the ones you use as your Facebook profile picture, hang on your walls and laugh about with your friends. 3) A change to let your hair down! It’s been a long day. The wedding has been exactly what you wanted it to be, but now the evening is here and after a few drinks, its time kick back and enjoy the night. With a drink in one hand and a giant inflatable hammer in the other, you’ll be ready to take on the world! Photo booths are also perfect for keeping children entertained. I had a photo booth at my wedding and the children all grabbed their favourite props and spent the evening chasing each other around the venue with giant inflatable saxophones, policeman helmets and oversized sunglasses. Many photo booths are mobile and can be set up in even the smallest of locations. They can even be set up in your house (if you’ve decided that’s where you’re holding your reception). As long as there’s access to power, you can have a photo booth. 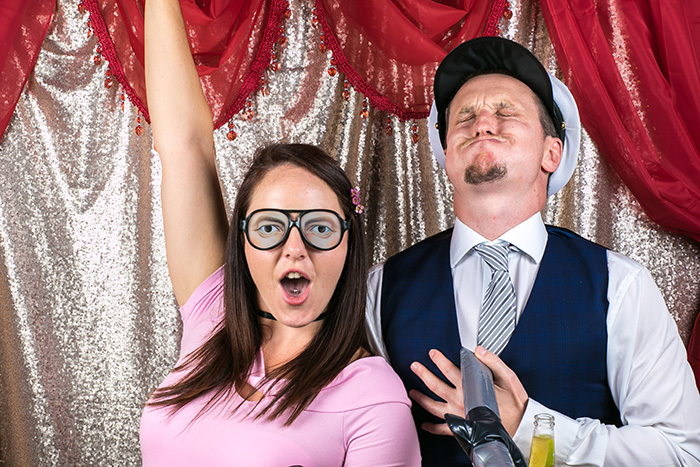 Most photo booths are pretty portable and can set up anywhere – whether that’s in a hall, hotel, converted barn or marquee; upstairs or downstairs. Many companies offer physical copies the photos on the night. That’s one for the guests and one for you to go in an album. Personally, I’m not a fan of that as the photos tend to get crumpled up or forgotten by guests. I prefer photo booth companies that give you digital downloads of the photos after your wedding. That way, you and your guests can all view the entire catalogue of photos and you can print the best ones yourself. Plus, digital photos make it super easy to name and shame the over-enthusiastic photo booth posters on Facebook! You might be waiting weeks, or even months to get the photographs back from your official wedding photographer. Photo booth pictures are quicker to edit, so you may get them much sooner – perhaps even on the same day as your wedding if you are getting instant prints. Photo booths are great fun and become a centre of attention at any wedding. They become a centrepiece for the evening that your guests can pop in and out of without feeling like they have to look their best. In fact, the later it gets and the more drinks are consumed, the funnier and more outrageous the photographs become! And… let’s face it… if you don’t get at least one photo of yourself in a Viking helmet during the course of the evening, then WHAT’S point of going to a wedding? ?